"I feel like I've discovered this speed that I didn't know I had." 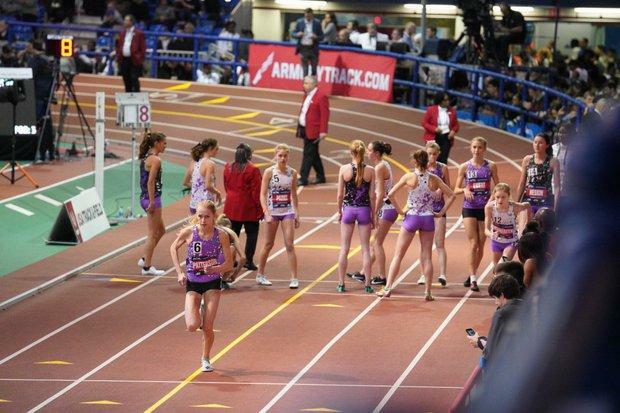 It was not an average meet day for Marlee Starliper at the 112th Millrose Games. But when all the chaos of competing at the country's most prestigious indoor track and field meet calmed down on Saturday in New York City, the Northern junior was a Millrose champion, completing a record-setting dominant performance at the Armory. The race was seemingly the easy part, as Starliper pulled away from a talented field to win by over 4 seconds. Leading up to the gun going off, the multi-time Pennsylvania state champion Starliper had to deal with a notable scratch, which made her scrap some pre-race plans, and then a medical emergency, which delayed the start about an hour. Regardless of how she got there, Starliper is a Millrose champion. Now she is as confident as ever and ready for the remainder of the indoor season with a major decision to be made. 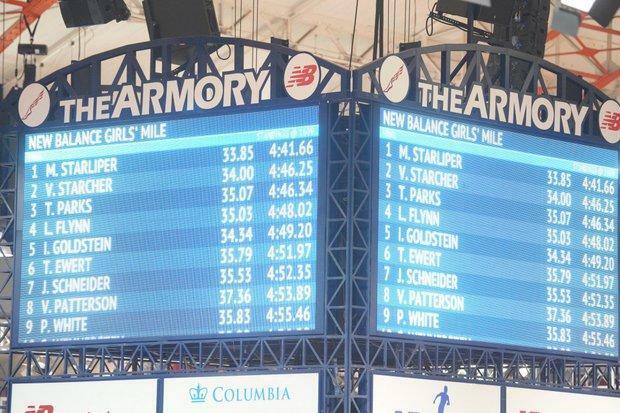 An hour and a half before the scheduled start of the Junior Girls Mile, Starliper found out that Katelyn Tuohy of North Rockland (NY), the current U.S. No. 1 miler and pre-race favorite would not be competing. While this development scooted Starliper in the role of "favorite," the reigning Pennsylvania indoor mile champion was a bit disappointed. "It was definitely a shock," Starliper said on Tuohy's scratch. "I was looking forward to being able to race her. It would have hopefully lead to a great time and I didn't know how the race would play out." 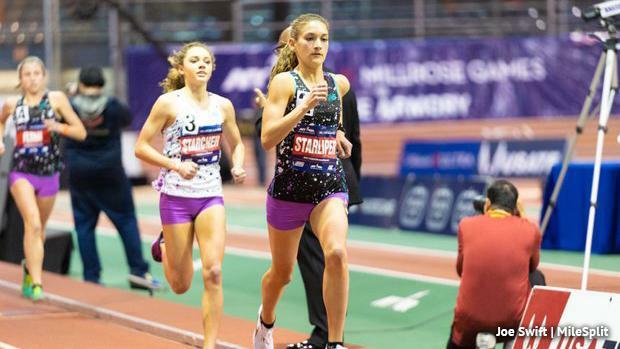 Starliper and Tuohy, both juniors, have actually only race head-to-head twice at last year's Millrose Games Trials and then again at the Millrose Games (Tuohy won the Trials, while Starliper was third to Tuohy's fourth at last year's Millrose Games). On the same day that Starliper ran a 9:20 3K at Penn State, Tuohy broke the high school national record, running 9:01. The stage was set for a battle between the country's top distance runners. Instead, illness would keep Tuohy off the track on Saturday. Without the 4:39 miler in the field, Starliper had to make some adjustments. "It did change the gameplan a bit," she said. "We figured she would be the one taking it out, but then, we just stuck with me running my own race and just trying to hit 70s and still go for a great time." Just as the Junior Girls milers were set to go off, an unfortunate occurrence on the track in the prior event would delay the start of Starliper's race. Professional distance runner Kemoy Campbell collapsed in the middle of the Men's Invitational 3,000 meters. Unconscious, EMTs have to revive Campbell on the track. He was rushed to the neighboring New York Presbyterian Columbia Medical Center, where he is currently being treated. He is reportedly in stable condition. "I was looking forward to being able to race her. It would have hopefully lead to a great time and I didn't know how the race would play out." The high school milers were told to leave the holding area and come back at 5:45 P.M. for an approximated 6:00 P.M. start, about an hour later than the originally scheduled start. It wasn't until later that Starliper found out what had occured on the track. Starliper put her legs up on the wall in the meantime and tried to conserve energy before she was to head back. "I've never had anything like that happen in race, but I feel like it was reassuring knowing everyone else is doing the same thing," she said. "I just tried to stay relaxed and do what I had to do to be ready to go again." About an hour later than the originally scheduled start, the Junior Girls were eventually ushered back on the track. Victoria Starcher (leading above) from West Virginia was actually the one to take out the first lap, with Starliper right there with her. Then on the second lap, Starliper went to the front. While her plan was to hit 70-second quarters, the delay threw everything for a loop. "I was going off feel a bit," Starliper said. "I wasn't sure how I was feeling at the midpoint of the race. It was very different having to be warmed up, but then when it was delayed I had to chill out for a bit and then warm up for a little bit again." She noted she felt a little tight from some built-up lactic acid, but was mostly feeling good once she got going. Starliper settled into a pace of mid-35-second laps through 1,200 meters. Starcher hung tough with Starliper, but on the sixth lap, the leader really opened up the gap. It wasn't time to get complacent, though. Starliper picked it up in the final 400 meters, closing in a 67 and earning a decisive win for the Millrose title. The clock showed 4:41.66. A Pennsylvania state record and a Millrose Games record. "I finished and I was like 'yep, I feel like there's a second or two left in there.'" Those records were on Starliper's mind coming into the race. After breaking the PA state record in the 3K a few weeks prior, she wanted to add the state record in the mile, and she did just that eclipsing Brianna Schwartz' 2014 all-time mark of 4:42.58. 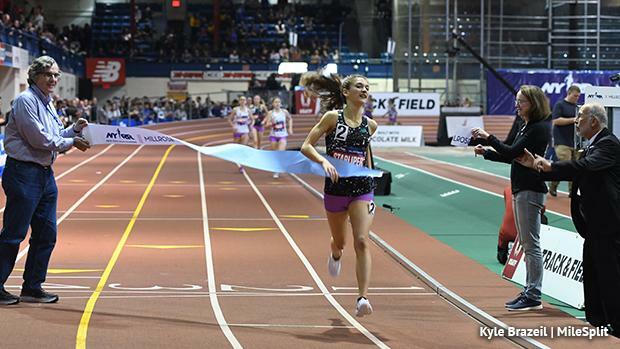 She knew it would be down to the tenths for the Millrose record, a 4:41.84 by Virginia's Kate Murphy from 2016. "I was hoping to break 4:40; that's been a big goal of mine for a while, but I was so happy just being able to run a PR." Starliper said. "I knew it was close (for the Millrose record). I finished and I wasn't sure if I got it or not." Saturday's Millrose performance is another big time in what has been a remarkable winter for Starliper. After a disappointing 13th place finish at Foot Locker XC Nationals, Starliper has been finding ways to better harness her pre-race nerves. She viewed the San Diego performance as a "blessing in disguise." "That's been a big thing for me this season," she said. "Knowing that I let my nerves get to me for that race, I've done my best to relax about everything and just choose not to worry about certain things leading up to a race. I'm really enjoying every moment of it when we go to these races." She's been enjoying some newfound speed, as well. For the second straight major race, Starliper put down a big negative split for the win. "Last year, my style of racing was just running myself into the ground and trying to hang on to a pace," she noted. "It has really fun this year because I felt good in all my races and I feel like I've discovered this speed that I didn't know I had." She even feels like she's got a little extra in the tank, too: "I finished and I was like 'yep, I feel like there's a second or two left in there.'" Starliper's next race this winter is still to be determined. She has qualified for the PTFCA Indoor State Championships in both the mile and 3K. She pulled off the double victory at Penn State last year and is poised to replicate that performance again this year. But she has also qualified for the 2-mile at the USATF Indoor Championships, set for Sunday, February 24 at Ocean Breeze in Staten Island, New York. That also happens to be the same day as the indoor state meet. Currently, she is undecided where she will race that day. "I'm so thankful that I was able to get two state records and now I can have a chance to run a fast 2-mile time in a field with great competition like that," Starliper said. "It's not totally decided what we're going to do yet, but that's what we're choosing between." The declaration window for USATF Indoors is Sunday, February 17 to Monday, February 18, while entries for PTFCA Indoor State Championships close on February 16. While she'll ponder that decision with her coach and family, the high school junior will continue to soak-in the experience of her win. "Winning Millrose is such a great opportunity and there's always such great competition there, so it really was exciting for me," Starliper said. 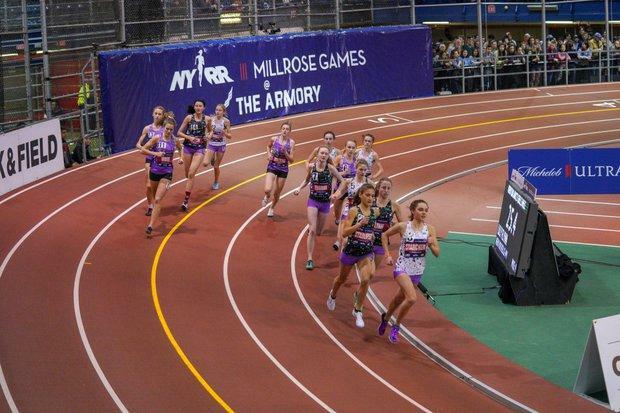 "The atmosphere is always so incredible -- that's such a thing about Millrose. I just had a blast the whole day there."